LAS VEGAS, NEVADA (July 8, 2014) – CounterPoint® has expanded operations, with the investment of more than $600k in new printing and converting equipment. The newest machines include the EFI™ VUTEk® GS2000LX superwide inkjet printer and Zund‘s S3 cutting system which increase the print size capability to more than 80” wide, add more custom shape options, and has enabled CounterPoint® to reduce the minimum order quantity. “We’re always thrilled whenever we improve our product offerings, capabilities, and are extremely proud of how accessible CounterPoint is for businesses of all sizes, with the new lower minimums,” said Paula Piano, Director of Sales. CounterPoint ®, along with sister companies Digispec® and Visstun®, is part of a family of companies producing American-manufactured products in its Las Vegas headquarters. 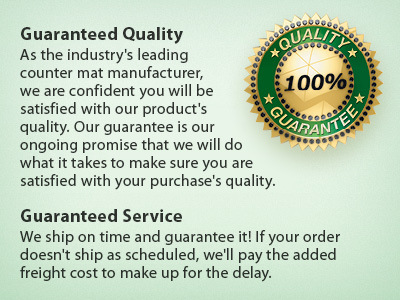 Launched in May 2001, CounterPoint® has become America’s largest manufacturer of point-of-purchase counter mats, which are produced using a unique manufacturing process that utilizes high quality polymers, plastics, and base materials not traditionally available from local printers and generic POP suppliers. In April 2012, CounterPoint® purchased Maryland based Convergence Corporation’s Precision Molded™ production lines adding this unique product to its extensive counter mat line. CounterPoint® has been honored numerous times, recently receiving three PPAI Supplier Achievement awards in 2014. As well as being named by Counselor as a Best Places to Work in 2013, 2012, 2011, 2009, and 2008.